Hi Dandi Crafters! Don't get spooked but this week over at MyGrafico Challenge Blog we turn our attention to Halloween. 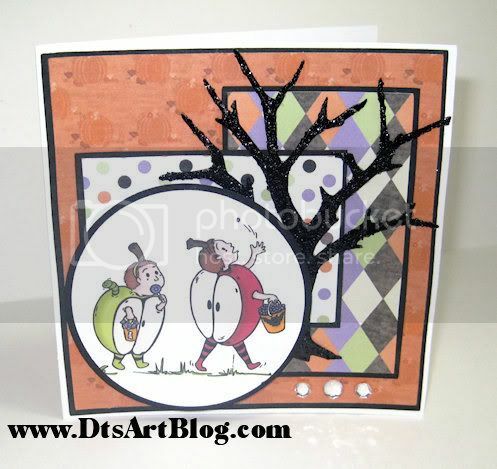 LOL I just love this darling Halloween Apple Brothers Stamp by Cherie Reve. You can check out the whole gallery of talented artist at MyGrafico. The reason I loved working with this whimsical stamp so much, is that I have 3 boys close in age and when they were little I used to dress them in matching and coordinating outfits all the time. This brought back fun memories of those days. All the pattern paper is my original designs. 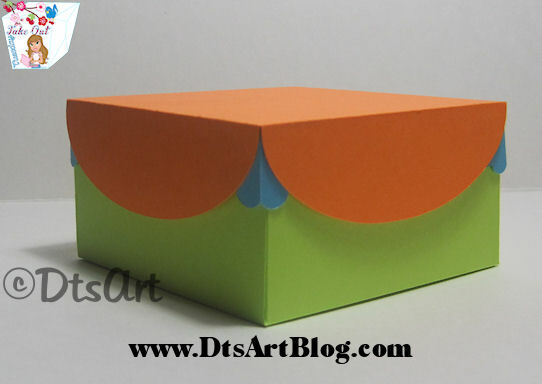 I have to say to those of you that buy and USE pretty pattern paper and card stock. I admire you. I only buy it. I can't bring myself to use pattern paper that I buy. I am guessing that it is because if I use it then I won't have it in the future when that perfect project comes along that I need it for....LOL Yes, yes I do know rationally that the perfect project I am saving it for will NEVER come along but scraptionally (like my word, just made it up feel free to use it. LOL. It means scrap rationality. Which we all know is something entirely different that rationality.ROTFLMBO) I can't bring myself to part with the pattern paper, to take scissors to it, to give it the honor of being placed on my Cricut mat for cutting. LOL ....Anyway back to the pattern paper. I think harlequin paper is just so fun for Halloween, don't you. Polka dot paper is great for every occasion. 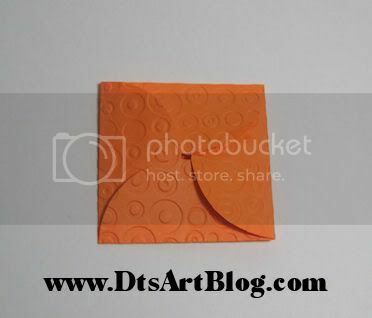 The orange pumpkin paper was just a no brainer for the card, although it was a multicolor paper I added an effect to make it a monochromatic. What about that spooky tree isn't it cute. It is from Cricut Cartridge Paper Doll Dress up page 52, accessories 3 with shift applied. I then added black glitter paste. Hey if I didn't add glitter paste to it how else would you know it's me...LOL I added it this time not so much to make it sparkley but to give it some spooky texture. I then added a few little rhinestones just for fun. 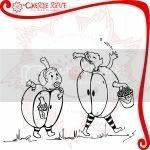 And there you go one cute halloween card! Hi Dandi Crafters! Happy Take Out Tuesday to you! I have been in a real box mood lately so I decided to share one with you. I hope you enjoy Tuesday's Take Out. Thank you following along with me. It is always enjoyable and encouraging to me if you leave comments too. Also if you haven't done so already leave your opinion about what you would like the 200 Follower Celebration to be and a big thank you to those that have taken the time to give their opinions. Hi Dandi Crafters! 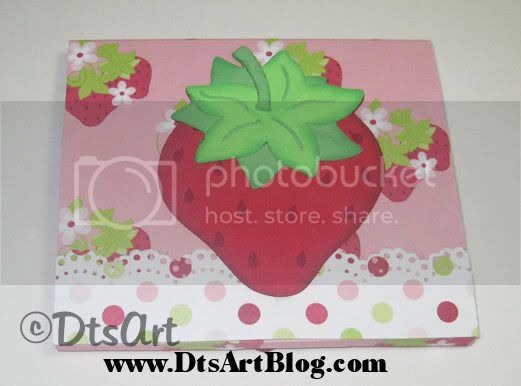 The other week I shared with you my cute little strawberry SVG download on Take Out Tuesday. (Did you miss it? If you did there is still a chance you can get it. Go to this post here and tell me which you would like for the 200 followers celebration.) 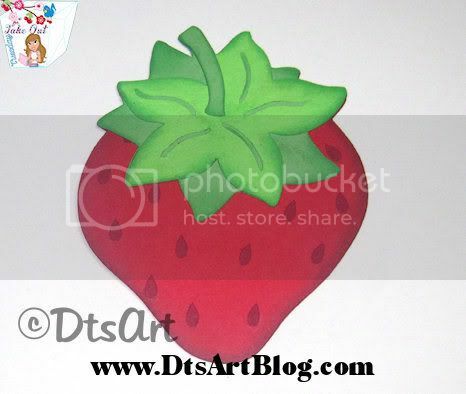 I thought the little strawberry that I made for demonstration was so cute that I should do something with it. School is right around the corner, and it always seems I need paper to write notes on for various reasons, taking someone's email address, phone number, or giving them mine. I always seem to be digging in my purse for paper in the hall ways of the school when dropping my kids off. LOL I decided to be proactive this time and I made myself this cute little matchbook notepad. How CUTE!! is it!!?!! I know it is too cute! 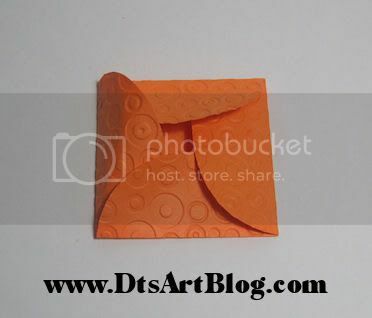 It is about 4.25 inches wide and 4 inches tall. It is the perfect size for scrap paper that I always seem to be digging for. 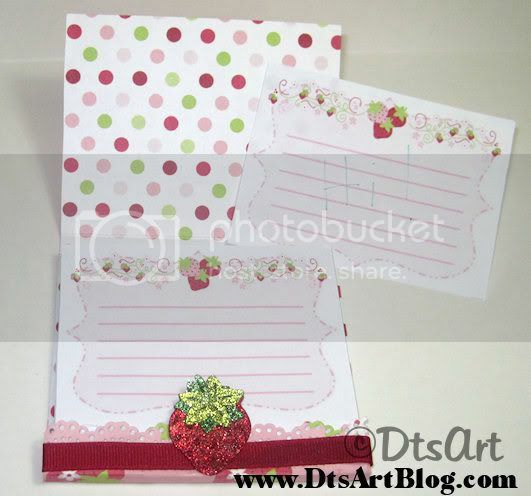 The whole purpose of this project was to use the strawberry SVG die cut. I thought, "Hey. I will break out the strawberry paper that I designed too". Since the inside is visible I didn't want to leave it plain so I made double sided card stock by adding some polka dots in the mix. 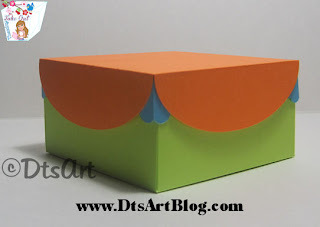 I know there is all the excitement and the hype of the Cricut Imagine right now, and I too am excited to get one; however, hybrid print and cut projects are an option with your Cricut already if you have it enabled with a program like SCAL or Make The Cut. You just have to know that the x and y axis that the programs show you are your friend. They allow you line up your printing with your cutting. Anyway I made up the cute little paper in paint shop pro, printed it off and cut it out. I don't have a Bind it all or Cinch. DARN IT! so I am left with the option of staples or notepad glue. I decide to go with staples this time. LOL I printed about 50 little note pad paper. I cut them out using my SCAL enabled Cricut 4 at a time. Since the point of this little matchbook notebook was to have scrapbook paper I wanted to be sure I could tear out the pages easily to be able to give them away. So I used my handy dandi little perforater by EK Success Cutterpede. I will tell you, I don't use the perforater very much at all in projects however when I need perforation there is NO REPLACING it. LOL After perforating the pages I just got my heavy duty stapler out and just stapled the pages into my little matchbook. The pages tear out, it is functional, and cute. What more could I ask for. I finished decorating the front by glittering a smaller strawberry svg. 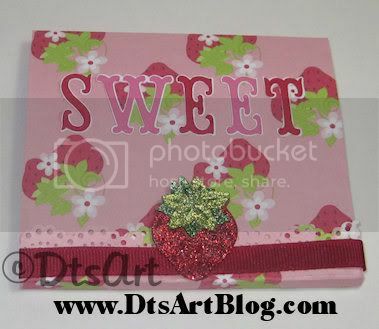 I also used the Cricut Storybook Cartridge and cut out the word Sweet for the front finished up the look with some ribbon and a Martha Stewart Border Punch. 1. Make ALL previous Tuesdays Take Outs available for download for a week so everyone can catch up on the ones they might have missed. 5. 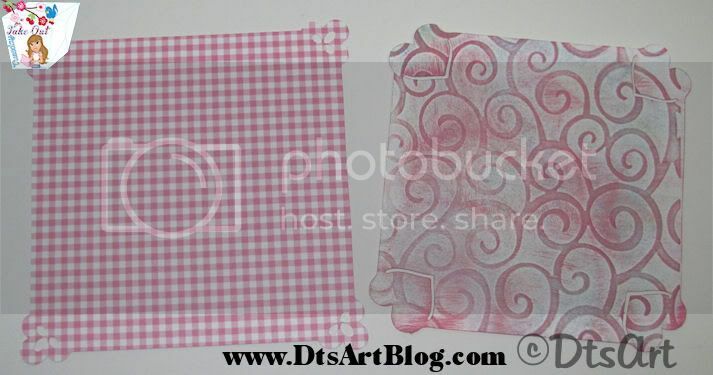 Give away to 5 followers 12 digital scrapbook paper files so they can print them whenever they want. 6. 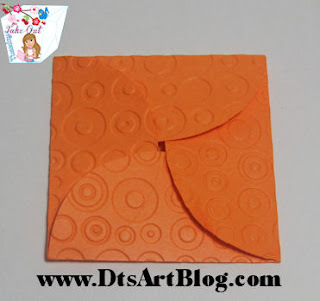 Do a general scrapbook RAK, of scrapbook stuff, that I mail. Here is the sample of the monsters. Hi Dandi Crafters! It is Wednesday, and that means it is time to head over to MyGrafico to get ready for this weeks challenge. There is lots of inspiration this week over at the MyGrafico Challenge Blog. This week is anything goes. 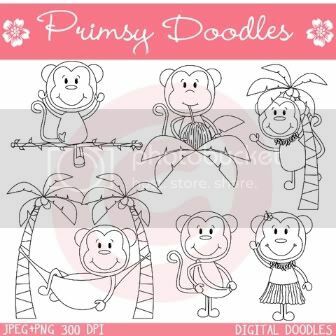 We are using these Monkey Fun Stamps by Primsy Doodle. They are so cute, I knew immediately what paper I was going to use when I saw the digital stamps. I made the monkey paper and plaid paper last April and knew it would be perfect for this project. Isn't it just perfect. I didn't even have to tweak the color at all. Just Perfect! 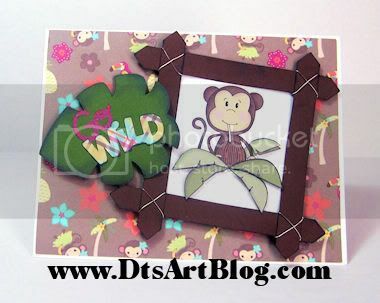 I was browsing blogs and saw a great frame made out twigs and I really liked the look so I made something similar for my monkey card. I just made some twigs using SCAL and cut out 4 of them. I added some ink to the edges and tied them up with wire, such a cute look for the monkey. I printed out an extra monkey in the trees and then cut out the leafs and put them on top of the first monkey picture using pop dots. I grabbed my trusty Create A Critter Cartridge, I KNOW I KNOW I should change my blog name to, ..."Yet Another Create A Critter.." LOL; I can't help it I LOVE the cartridge, and cut out the leaf that is on page 51 in the handbook. I thought the, "Go Wild" on page 29 was perfect too so I used that. I inked the leaf a little bit and there you go. A pretty simple card, yet it really makes a statement. I hope you enjoyed it. I know I did, but I always enjoy it when you stop by for a look-see and a chat! Hi Dandi Crafter! Thanks for joining me for another Take Out Tuesday. Today we have a cute little Bracket tag. I needed a small bracket tag with holes on both sides. I looked at some of my cartridges and didn't see one exactly like I needed so I made one up. The Shadow layer and the sign layer are the same size, it just depends on if you need a hole or not. The project I needed it for needed a hole on each side. (Sorry, can't show you that one just yet,it is getting ready for publication. It should be posted on my blog around mid November. Along with a very cool announcement. Be sure to check it out.) This file does well being cut small , on my project I cut it at just over 1.5 in width and just under 1 inch in height. Thanks for following along with me. Enjoy this weeks Take Out Tuesday Freebie. Please download it soon because as you know Take Out Tuesday are available on Tuesday and Wednesday and on Thursday we toss the left overs. Download:No longer available. Please join us next Tuesday when Fresh Take Out will be posted. Be sure to become a follower so you will not miss anymore Take Out Tuesday Freebies. Take Out is posted for my followers to download on Tuesday and Wednesday, on Thursday we throw out the left overs. Hi Dandi Crafters! I don't show all my graphic work only selective projects. Yes I work more than I let on....LOL hehehe. I do really like the way this little logo turned out. Maybe I think it will make a cute card stamp too. 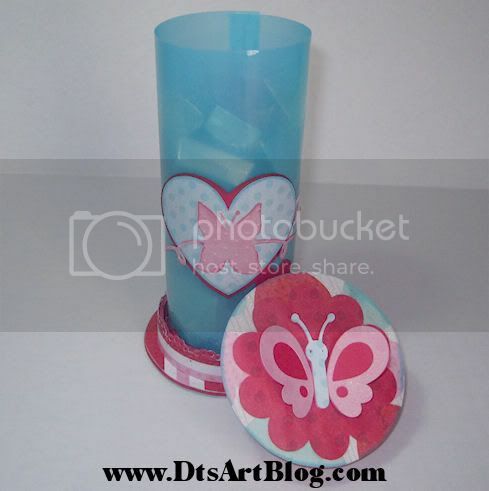 I recently got to work with Vanessa over at the Country Chicken Creations Blog. She wanted a little chick to call her own. I could totally relate. Gee I have been using my girl for oh 4 or 5 years now. People see my girl and they know it is me. It is kind of cool really. Vanessa came to me because she wanted a chick of some kind drawn so she could get a stamp made from. She wants to stamp the back of her cards that she makes. She makes some super cute ones too. After discussing the chick with Vanessa a bit she told me she wanted a chick with an umbrella and/or rubber boots. I thought that was a super cute idea, so I helped Vanessa bring her idea to life. That is what I like about the graphic work. I meet so many people that have an idea about what they want but don't know how to go about getting the idea out of their head and into a medium that they can use. It is really fun to me. Pop on over to the Country Chicken Creations Blog and have a look at her blog logo it is super cute and a bit different than what is shown here. Feel free to drop me a line if you need some graphic, blog or web site design done, well have fun! A while back I posted that I won RAK from Addicted To Paper. I am always struck by the generosity and kindness that goes on in the scrapbook community and all the lovely people that congregate in the scrapbook community. It is a very lovely community, glad to be a part of it. Y'all are just SO NICE!!! Well anyway to get to my story, Tammy and family over at Addicted To Paper recently added a couple of feet to their house by the name of Ella. So like the saying goes, "One good deed begets another", or whatever it is that my mother always say. I sent Tammy a little welcome to the world gift for her baby girl Ella. Congratulations Tammy to you and your family. Ella is beautiful. 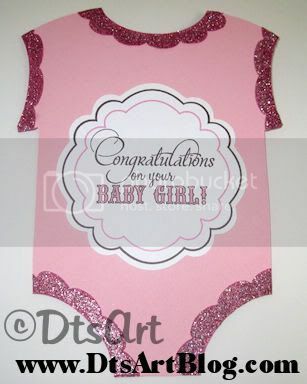 The pink onesie card is from an SVG file that I drew up sometime ago. I cut the card using Sure Cuts Alot, SCAL. That is such a useful program and opens up a world of possibilities for your Cricut. Since the card was a girl onesie I wanted scalloped sleeves and neckline. I also used SCAL to cut out the scalloped neckline and sleeves. After I had them cut out I then added my glitter paste in pink. You can find out more about my glitter paste here. 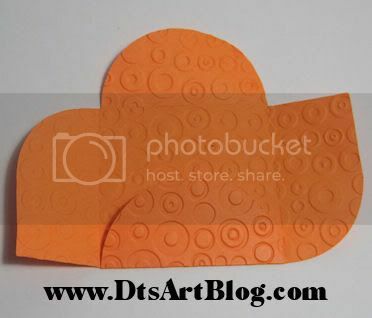 The little bird is from the Cricut Cartridge Create A Critter Page 45, Bird 2. I used companion cuts on page 45 again the Layer 1 button with shift applied. The wing is also on page 45, Layer 2 again with shift applied. The circle that the little bird is on is also from Create A Critter, page 43, the Phrase button. The pink polka dot paper was rather fun to create. I had, of course, some light pink polka dot paper on my computer that I printed off on pink card stock. I really liked the effect. I then took my homemade pearl spray that I discussed here and sprayed it on the card stock but instead of copper acrylic paint I used pink acrylic paint. 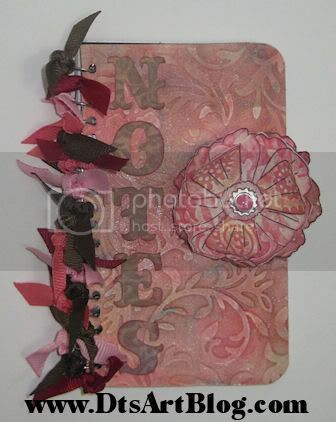 I like the shimmery pearl look it added to the card stock. Since this was a flat note card I didn't want the back to be naked...LOL so I dressed that up using the same scalloped cuts for the neck and hole openings that I used on the front. I then added a little message of congratulations to it. 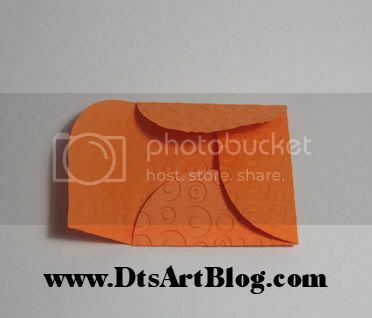 The little accent card with the message was cut out using SCAL from a cut that was a Tuesday Take Out download a few weeks ago. I think the whole card came out rather cute. I also made her a real onesie for Ella to wear. It is my Pink Faux Applique Initial onesie. This particular style is one of most popular styles. It is a heat screen tee not an appliqued onesie but the style really mimics the look of an appliqued letter on the front, but the best part is no worrying if something is going to come off in baby's mouth. cause it is just a tee. I came up with faux applique awhile ago LOL by accident while trying to achieve another effect. I was actually getting pretty frustrated because I couldn't get the effect right but when I stopped for a minute and let my tunnel vision pass. I notice that THIS EFFECT!! was AWESOME on it's own merit and looked very similar to piped applique. I put in on an initial onesie and the rest is as they say history! It is not lost on me that with babies a lot of time you see their backs as much if not more than you see their front so I put this little e on the back. You can purchase this onesie for a baby you know. 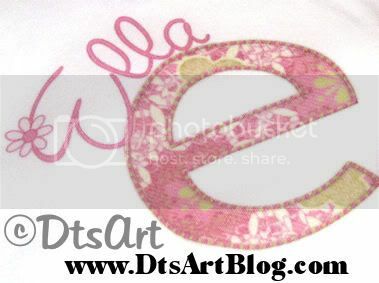 You can do so on my website http://www.dtsart.com/category_14/Initial-Onesies.htm I have many onesies to choose from. Hi Dandi Crafters! YIPPEE! That was my reaction to this weeks MyGrafico Challenge. My Guppie loves Bunnies! Loves Pink! Wow is really even fair to call this a challenge for me? LOL! I spend a lot of time in discussions about bunnies and pink, even pink bunnies. LOL My daughter can't get enough of either of them, she loves them both. LOL I knew that when I was done with this card it was going to sit on her desk. 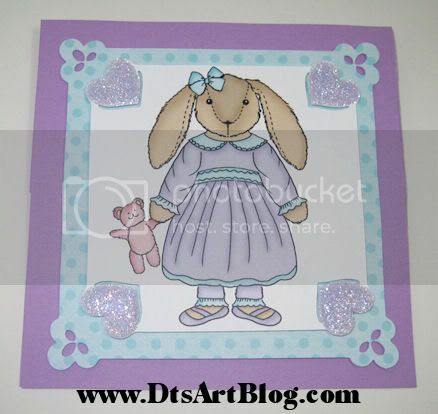 That is in part the reason I made it an Easel card, that and that they are so darn cute. This was a picture inspiration challenge. We were given this picture and we were to use the colors in the picture to inspire us. 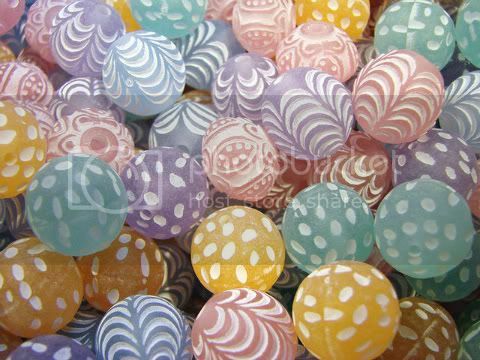 Wasn't hard these are wonderful pastel colors. 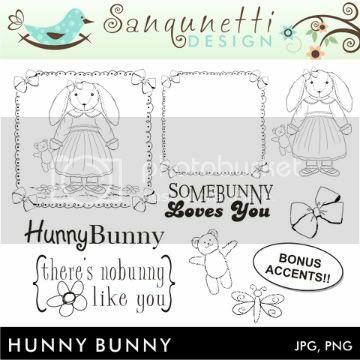 The wonderful digital stamps are Hunny Bunny Stamps by Sanqunetti Design. Be sure that you pop over to the MyGrafico Challenge Blog and see what all the design members were inspired to do. I used some lavender colored card stock for the bases of my card. 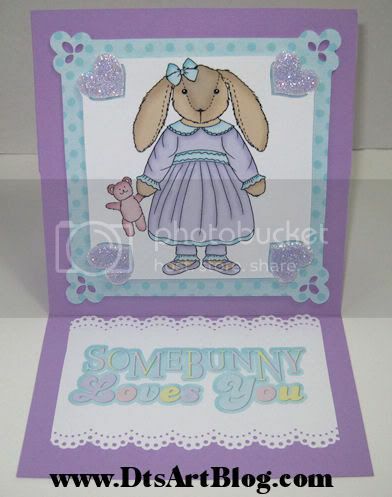 I wanted to pull out the lavender and turquoise in the bunny's dress. I used turquoise polka dotted paper with a bit of grunge applied that I had on my computer. I printed it off on white card stock. I then used SCAL to assist my Cricut to cut out the little square with the bunny printed on it. 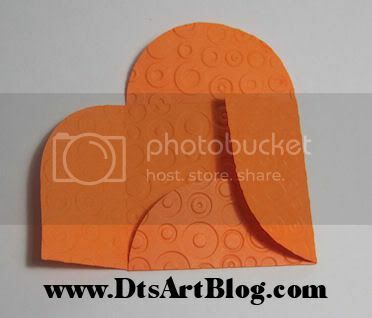 I thought it needed hearts so I designed the square to have heart stencils in each corner. And you know me, they totally needed some of my Glitter Paste. I also used my computer to change the Somebunny Loves You brush to be softer pastel colors. I then took my only, lonely, Martha Stewart punch to the sentiment. For all those that are regulars and followers of my blog I hope you enjoy today's Take Out Tuesday. Thank you for being a regular and giving me an audience to share my scrapbook designing passion with so I am not just talking to myself...LOL Enjoy it, see you back here next Tuesday for some more Take Out. 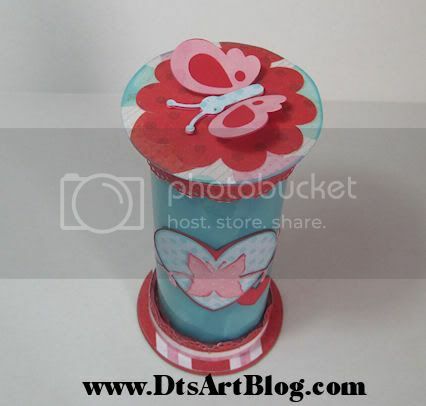 Hi Dandi Crafters, today's challenge over at MyGrafico is to make a distressed vintage project. 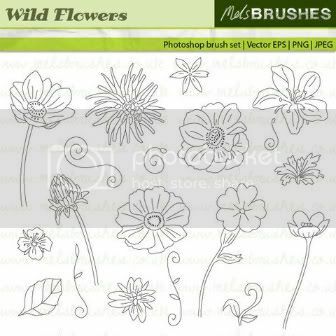 The stamps that we used to inspire us are called Wild Flower Stamps by Mel's Brushes. Be sure to head over to the MyGrafico Challenge Blog and see what the whole creative design team came up with and enter your own project. As for me....well this project is one of the reasons I like being on a design team! Vintage and distressed is just not something I would ever tackle without a good reason. I would have avoided this challenge had I not been on the design team. LOL! Like most people I tend to stick with the styles I do well that I am comfortable with and vintage distressed is not one of them. I admire, even love, projects with this look but it is not my strong suit. Overall I have to say I was extremely happy with the way my mini notebook turned out. I printed out about 6 flowers on white card stock. I cut them out and cut all but 1 apart. I then proceeded to crumple them up, put them through the crimper a few times and then smoothed them. Next I took out some Martha Stewart pigment ink pads in yellow, orange, pink and red and proceeded to bounce these inks all over all the flowers and pedals. 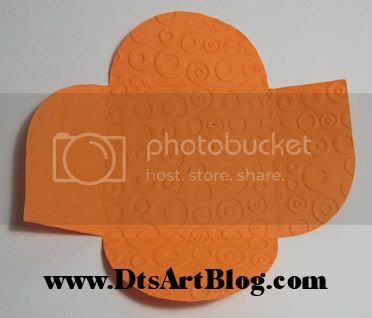 After that I used some cuttlebug dry embossing folders to add texture. Finally I added more pigment ink to bring out the embossing. I then glued the various pieces onto the full flower after curling them all with a pencil. 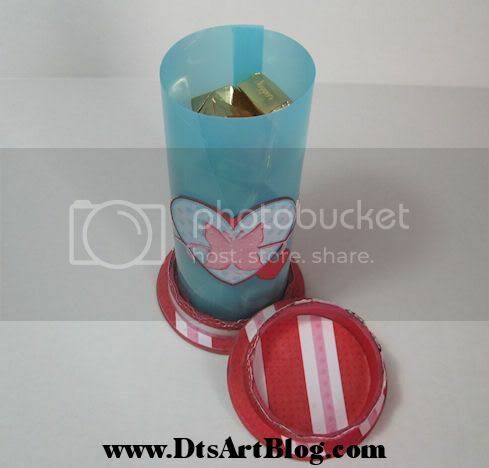 I used my crop a dile and punched a hole in the middle of the flower and on the cover and secured using an eyelet. I used a brad to decorate the center. To make the cover I used white card stock and bounced pigment inks all over it and then dry embossed and smeared on more pigment inks to bring out the embossing. I then used my crop o dile to punch holes along the left side and slit each punched whole in the middle so it would fit over the wires. I wanted the word Notes to look the same but not get lost in the background. So I printed some brown grunge paper I made on my computer on beige card stock. I then took pigment inks to each letter after cutting. The font fit perfectly with this theme and is called Big Top. 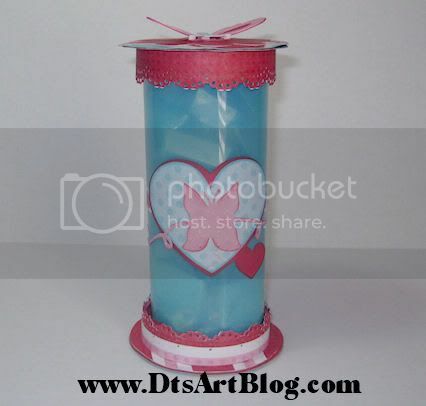 I then added ribbon in various colors and cropped each diagonally. Then being a former bow chick, I heat sealed the ribbon so it wouldn't fray. Hi Dandi Crafters, happy August to you on this fine Take Out Tuesday! This week I have 2 more loopy frames for you. Did you see my Corner Bookmark created using one of the loopy frames from last week? I have a corner bookmark tutorial about it. The frames as you see them in the picture measure around 4.5 inches. Enjoy Tuesday's Take Out. I provide Take Out for my regular readers and followers as a thank you. Take Out is available for download on Tuesday and Wednesday. Thursday we throw out the left overs.